Nothing reminds me of home more than this perfect summer drink, one that evokes hot sunny days eating al pastor tacos in the Mission district of San Francisco and sipping on homemade agua frescas. Mexican horchata is, mostly simply, made from rice, water and milk. 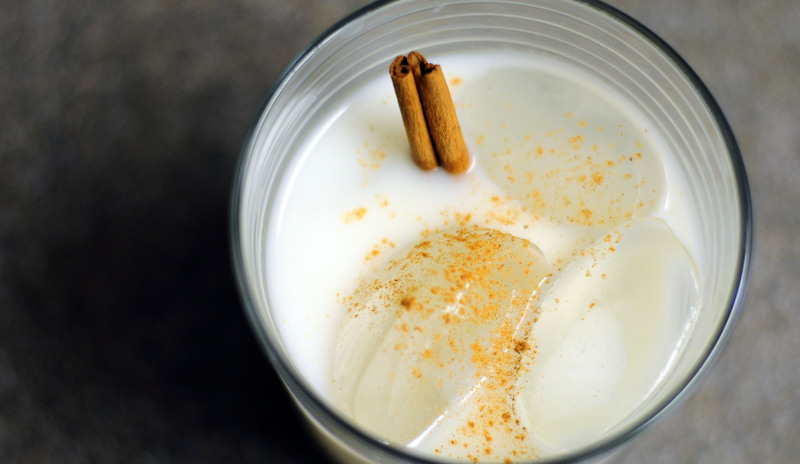 There are many kinds of horchata, whose variations include almonds, condensed milk, and even lime zest, but this is beautifully simple to make. I used a recipe posted by one of my favorite bloggers, David Lebovitz, which he, in turn, got from this book. As soon as I got back to school and was greeted by 80 degree heat and 50%+ humidity, I decided that I needed cool liquid relief in the form of cinnamon rice milk. Having only just moved into my new apartment, I didn’t have some of the tools required (a sieve? cheesecloth? in a college apartment?). If you don’t have a blender, just smash the rice in a sturdy plastic bag with a pan. Some horchata recipes don’t even include the blending/crushing step, so feel free to ignore step 1. I also found that when the horchata sits overnight, the rice bits collect nicely at the bottom of the container. Unless you like munching on raw rice, don’t stir up the contents before pouring it out. No sieve needed! Here’s a simplified, but still very tasty, version of this drink. 1. Crush rice to a coarse sand by a) mixing in a blender or b) smashing it in a sturdy plastic bag with a pan. 2. Put rice, cinnamon sticks, and warm water in a container or large bowl. Cover and refrigerate overnight. 3. Pour liquid into another container or pitcher. The rice sediment should have collected at the bottom of the container overnight, making it easy to pour out just the liquid. Lacking a sieve and cheesecloth, I just squeezed handfuls of the pulp to extract more rice flavor. 4. Mix in milk and sweeten to taste. Stir until sugar dissolves. Pour over ice and sprinkle ground cinnamon over it. Notes: I tried sweetening with sugar, agave nectar, and honey. The honey was too overpowering and distracted from the flavor. If you’re health conscious, agave nectar is a great substitute, but since it’s pricier, sugar will do just fine. Also, sprinkling ground cinnamon over the drink really takes it to another level. Since smelling is just as important as tasting, the cinnamon gives it a nice kick. This entry was posted in Non-boozy, Recipes and tagged cinnamon, horchata, mexican, rice.